One interesting thing about the internet age is how accessible celebrities and politicians can be to a a big, largely faceless public — if they want to be. But it also means that those politicos are able to chime in on each other, and try to score a few political points along the way. Case in point: Louisiana Governor Bobby Jindal struck at Hillary Clinton on Twitter, a social media micro-feud that could foreshadow things to come. It's not a multiple-reply, all-out Twitter war, to be clear. It's generally inadvisable even for regular people to get involved in those, much less high-profile, opposing party politicians (I realize Hillary isn't technically, officially in politics right now, but come on). Rather, it was a passing taunt aimed Hillary's way, on a subject that's been much-discussed recently — Republican Senator Tom Cotton's open letter to the leadership of Iran (co-signed by 46 other GOP Senators), aimed at dissuading them from current nuclear negotiations with the United States. It's spurred ferocious criticism and debate among liberal and progressive circles, with some branding the group of Senators "traitors" over it. And while she stopped light-years away sort of that kind of inflammatory rhetoric, Hillary made it pretty plain how she felt about the whole thing, arguing that no presidential candidate should support such a thing. Now, normally, that sort of boilerplate statement (because obviously she doesn't support the Cotton letter) would just come and go with little fanfare. But maybe that's only because prominent political opponents rarely chime in to hit back. 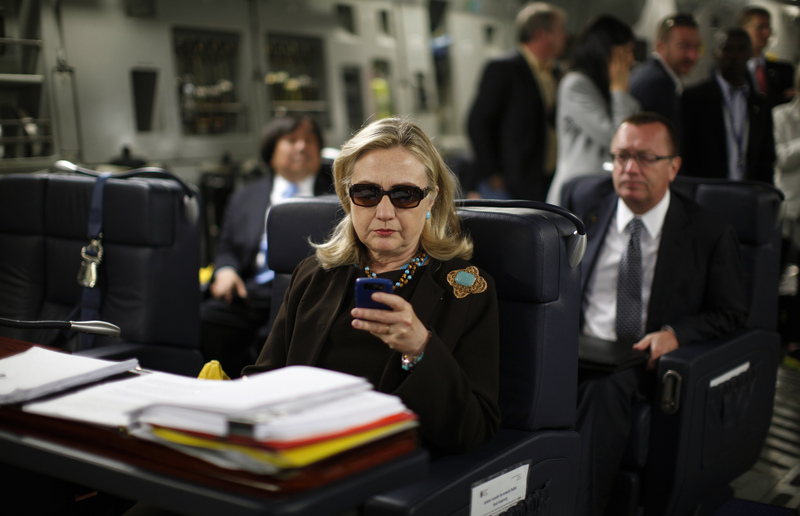 A mere 27 minutes after Hillary's tweet was sent, Jindal responded with disdain. It bears mentioning that it's altogether likely neither Clinton nor Jindal actually authored these tweets themselves — unlike the authenticity of Senator Chuck Grassley's rambling, often incoherent Twitter account, politicians on social media often turn control over to a team that knows what it's doing. Whether that's the case with Jindal and Clinton isn't clear, but at the very least they or their proxies had themselves a little clash today. Let's save some of this for campaign season, huh?